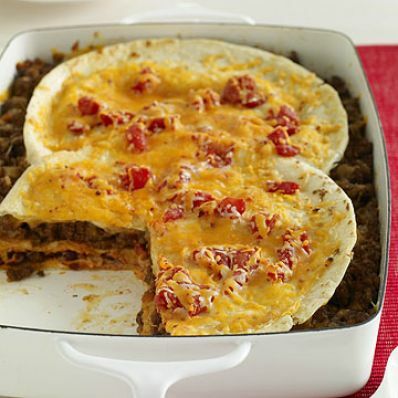 Layers of tortillas, beans, salsa, a taco cheese blend, and beef mixture make a richly flavored main-dish recipe for your family. 1 of 5 Heat oven to 375 degrees . Coat a 13 x 9 x 2-inch baking dish with nonstick cooking spray. Set aside. 2 of 5 Spray a large nonstick skillet with nonstick cooking spray; heat over medium-high heat. Crumble in ground beef and onion. Cook for 8 minutes, stirring occasionally. Add chili powder, cumin and salt and cook 1 minute. Stir in 1 cup of the salsa and heat through. 3 of 5 Line the prepared baking dish with 2 of the tortillas. Cut a third tortilla into pieces, and use some of the pieces to completely cover bottom of dish. In a medium-size bowl, coarsely mash the beans and stir in 1 cup of the salsa. Spoon mixture evenly over the tortillas in the baking dish. Sprinkle 2/3 cup of the cheese over the top. 4 of 5 Place another layer of tortillas (and tortilla pieces) over beans and cheese. Evenly spoon beef mixture over tortillas. Sprinkle with 2/3 cup of the cheese. Place the remaining tortillas over the beef and cheese layer. Top with the remaining 1/2 cup salsa and the rest of the cheese. 5 of 5 Cover with foil and bake at 375 degrees for 45 minutes. Remove from oven and allow to set for at least 10 minutes before serving.